How Many Links Should An Infographic Get? 2010 was declared by some as the year of the infographic. And when everyone jumped on the bandwagon, infographics quickly became the 2010 version of a top 10 list. So Why The Explosion In Infographics? With content still reigning as king (or at least queen) in the link-building world, and attention spans getting shorter and shorter, data visualisation remains a great way to deliver a message in a short and attention-grabbing manner. But Can Infographics Live Up To The Hype? I wanted to analyse some sites that have been successful gaining links to visualised data (not necessarily infographics), and see if we could gain some insight. With one piece of well thought-out (and well-timed) content, you could get more links than your blog's homepage, and as many as 588(! ), like Hitwise did with this post. Not difficult to see why some might go starry-eyed with the promise of such a yield. However, before we get swept off our feet, it's worth considering the proportion of these posts that really strike gold (see chart below). To put that in perspective, these figures were taken from a sample size of 2146, 953 and 627 posts respectively for Hitwise, Mint and Visual Economics. 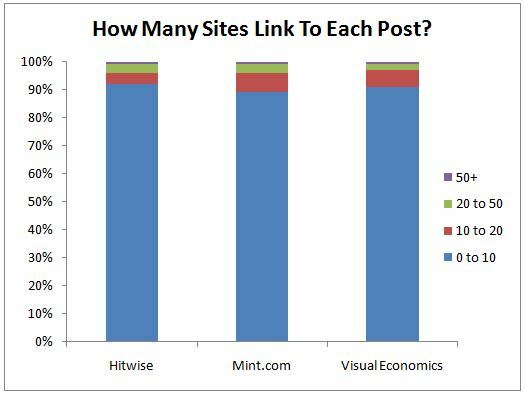 So, of Mint.com's 953 posts (many of which were full-on infographics), only 37 of them gained more than 20 linking domains. 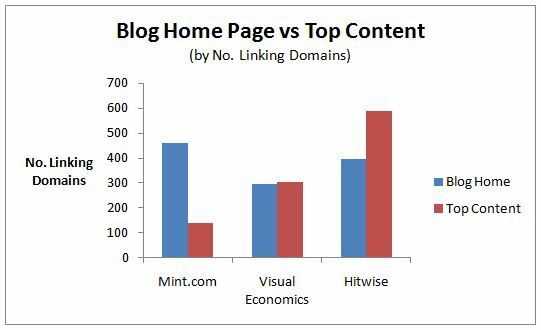 And for Visual Economics, 22 pieces of content (out of 627) gained links from more than 20 domains. Talk About The Midas Touch! 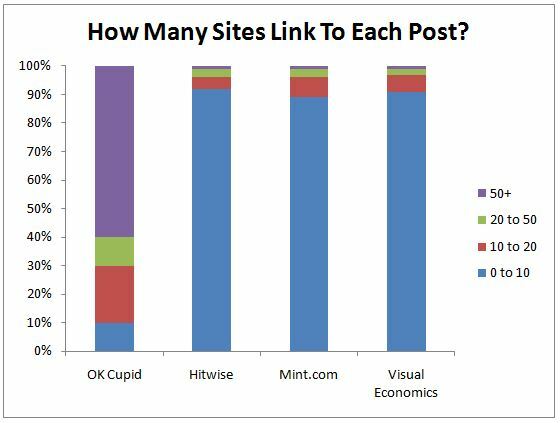 I was tempted to say that OK Cupid's strategy is to opt for quality over quantity (and it is), but you'd be hard pushed to say Hitwise, Mint and Visual Economics aren't turning out high quality stuff. That said, OK Cupid have only actually put out 20 posts in the last 20 months, and not always as frequently as 1 a month. It would be careless of me, at this point, not to acknowledgge that the smaller number of posts by OK Cupid taken into consideration may be skewing the data. However, to release only 20 posts in 2 years, and have 12 of them attract more than 50 links, this isn't just a sampling error. These Guys Are Onto Something! 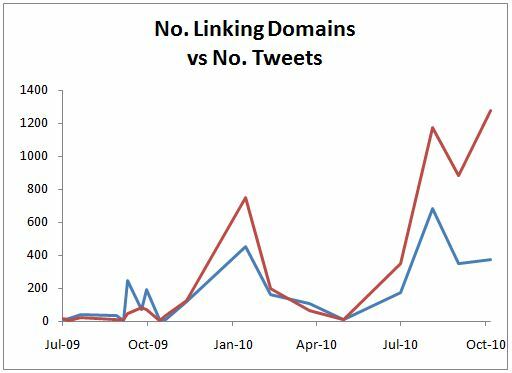 Another interesting graph I pulled out of the data shows the number of tweets per OK Cupid post against the number of linking domains. And while the number of tweets seems highly correlated with the number of linking domains, initial analysis of other social metrics suggests the number of Stumbles or Facebook Likes are not correlated with the number of linking domains. Put simply, link-bait can really pay dividends, and content really can act like a link magnet, but it's a numbers game. You have to be in it for the long haul, and not be expecting every piece of content to open the floodgates. As you can deduce from the charts above, 10 strong links is not a bad result. Rather than cursing your luck after hours of toil, it may be worth improving your processes so the input justifies the output, and you can start to churn out quality content on a regular basis. And if you do knock one out the park, be sure to let us know.